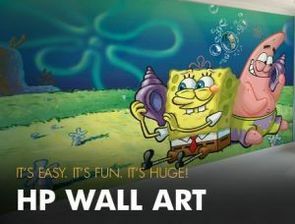 HP have recently announced they will launch HP Wall Art. A software package designed to make customised wall covering easy. The digital wall covering or "Wall Art" sector is an increasingly popular service whereby customers can request from their print service provider a tailor made designed wallpaper unique to them. Anything can be produced from a home made design or pattern, to family photos or company logos. The online design software can be used to accompany the Successful HP Latex L26500 printer in producing Digital Wall Coverings. Smart features such as inputting accurate measurements, allowing for obstructions such as doors and windows, and tailoring where images lie or overlap, are just some of the user friendly functions that make this superb software an exciting add on to your print service, or interior design offering. The software will be officially launched at Heimtextil 2013 in January, but take a look at the sneak preview below !